George Clooney's political drama coming to high-definition in January has now been fully detailed. 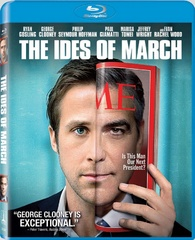 As previously reported, Sony has revealed 'The Ides of March' is headed for Blu-ray on January 17. The film was nominated for the Golden Lion and won director George Clooney the Brian Award at the Venice Film Festival. Ryan Gosling stars as an idealistic staffer for a newbie presidential candidate (Clooney) who gets a crash course on dirty politics during his stint on the campaign trail. The Blu-ray will feature 1080p video, a DTS-HD Master Audio 5.1 soundtrack, and supplements will include commentary with George Clooney and co-writer/producer Grant Heslov, four behind-the-scenes featurettes, and an Ultraviolet Digital Copy. You can find the latest specs for 'The Ides of March' linked from our Blu-ray Release Schedule, where it's indexed under January 17.